Providing you the best range of vintage neck yoke with effective & timely delivery. 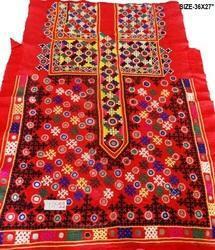 Authentic VINTAGE Hand embroidered textile from the tribal nomads of northern India called BANJARAS. These textiles are ornately hand embroidered by the banjara tribals with colorful threads and embellished with mirror insets . They are quite old and may show signs of wear . But that adds to their authenticity and appeal ! Authenic Textile..NOT a Replica ! These precious textiles can be used for making belts, Bags, Clutches, Costumes or other exciting projects.